A conversation with cousins Guillaume and Jonathan Alric about their stunning films and sensitive dance music. There’s a shiver-inducing moment midway through “Territory,” the second short film by French duo The Blaze. A boxing coach, standing before a transfixed gaggle of young men, demonstrates sharp one-two punches that line up with the synth jabs of the song. It’s magical, and a perfect visual for The Blaze, whose small output of songs and videos have focused on moments of intensity and intimacy between men. But it’s also just a cleverly executed moment of sound and film working in unison; every time those synths materialize, the punches appear in the mind’s eye, too. The elusive duo’s attention to detail has made fans out of everyone from Moonlight director Barry Jenkins, to renowned Greek/French director Romain Gavras. The Blaze are Jonathan and Guillaume Alric, two cousins — both “about 30” years old, they say — who live in Paris. Born in Ivory Coast, Jonathan returned to France as a three-year-old, where he and Guillaume both grew up in small villages, surrounded by the classical music their parents loved. Guillaume later developed a love of reggae, and began producing his own take on dub under the name Mayd Hubb. Jonathan, meanwhile, went to film school in Brussels. While living there, Jonathan asked Guillaume to help him soundtrack a music video he was making for class, and they began to make music as The Blaze. Their collaborations draw on the warm feel of dub music, but also make use of glittering percussion and mournful vocals (both cousins sing, but their vocals are distorted to sound more or less the same). The result is a hypnotizing, slowly unfurling sound that straddles house and pop, an aesthetic that was first properly unveiled in 2016 with “Virile,” their tender debut video on Brodinski’s Bromance Records. During a Skype call from their studio in late March, the sandy-haired Guillaume vaped intently, while Jonathan, with dark curls and round glasses, spoke in English that, though fragmented, still sounded rather poetic. With the aid of a translator, we chatted about how they began working together, the films that inspire them, and Territory, their debut EP out today, April 7. What are your cinematic influences? JONATHAN: We like social cinema. Like Ken Loach. I don't know if you've seen American Honey by Andrea Arnold. [Watching that film] was a very good experience. We liked the energy, the liberty, and the beauty of that movie. The first movie that really mattered [to me], was Amores Perros, [directed by] Alejandro González Iñárritu. GUILLAUME: In general, we love cinema speaking about humans. Like Les Valseuses — an ancient film, speaking about the relationship between two guys on the road. We love this kind of cinema — when everything is about emotion, love. Why is it important for you to release your music with visuals? GUILLAUME: It's really a fusion. We start with [either] the music or the visual, but it's a long process. JONATHAN: We never hesitate to go back. We are very hard on ourselves. We talk a lot. It can take a long time. “Virile” is a tender depiction of friendship between two men. What was the idea behind it? JONATHAN: We were looking for a very simplistic idea. Because we are two, we had the idea to make [it about] two people in the room, smoking and dancing and singing. GUILLAUME: We made this by ourselves, so we didn't have a lot of money. So we think, Okay, we just have one room and two guys. What we can do with that? JONATHAN: The most important thing for us in "Virile" was talking about what we know about relationships between guys. About friends spending time together... like the two of us, working on music. It was a photograph of what we were living at the time. There's always something of us in [our visuals]. GUILLAUME: It's like mise en abyme. What does the “Territory” video mean to you? JONATHAN: We all have a place we call home, and we often live far from it. “Territory” tells the story about a young guy going back to his family after a long time. It was, for us, a way to show strong feelings like love, and maybe the arrogance of youth. This situation is never easy — you sometimes have to fight to feel home again, in a place you don’t belong anymore. It’s a strong feeling of joy, and contradiction. GUILLAUME: It’s not only about masculinity. We’re always looking to highlight youth in our music videos — this is something that is really important to us. The way you act with your friends, and family, the way you share moments, this freedom. Why was youth an important thing for you to represent? JONATHAN: Because we are young! In our EP, there’s also the title, Territory. For us, there is many different meanings for that. Like, it's our first EP, so it's like we take our place in this paysage — this landscape of music. [The EP is] the beginning of our story. On the other hand, it’s less personal and more universal. Nowadays, the idea of territory is stronger. We want to move forward and go over these borders. How long did it take to make the EP? GUILLAUME: We had a lot of tracks. We made like, 100 tracks for the EP, and we just took five of them. JONATHAN: It took a year, at least. We were traveling a lot. I was living in Brussels, and then sometimes I would go to Dijon, because the music studio is in Dijon, where I lived with Guillaume. And sometimes he came to Brussels to work and drink some beers. We also made one of the tracks in our grandfather's place, in the south of France. We stayed with him like a week. Each song is like a reunion, a crossroads. 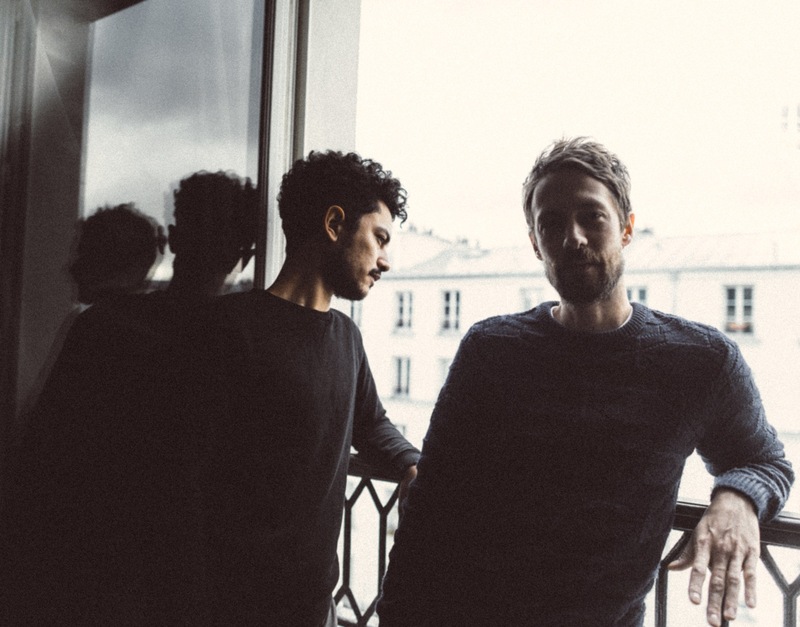 GUILLAUME: We are working on an album, working on the next video. And we're working on the live [show], too. One more thing: why did you choose the name “The Blaze”? GUILLAUME: We love this name, because “the blaze” means something warm, something that can destroy stereotypes. “The blaze” is something strong, generally. JONATHAN: In French, "blaze" is "name,” in slang. GUILLAUME: Like you can say, in French, "My blaze is Guillaume." But the principal meaning is warm and strong things — love, and hope. Territory is out now on Animal 63.